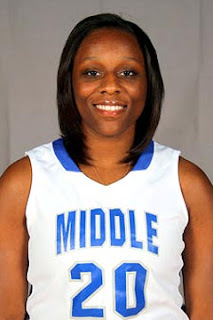 Murfreesboro Police confirmed Wednesday that Tina Stewart, Memphis-native and Lady Raiders basketball player, was the victim of a fatal stabbing at an apartment complex. According to Kyle Evans, a spokesman for the Murfreesboro Police Department, Stewart, a 21-year-old junior at Middle Tennessee State University, died as a result of the incident at Raiders Crossing Apartments. Police were sent to the apartment complex in reference to a disturbance around 7 p.m. Wednesday. Tina Stewart and her roommate, 18-year-old Shanterrica Madden, an MTSU freshman, had engaged in a fight. Evans said that Stewart suffered multiple stab wounds and was transported to Middle Tennessee Medical Center where she later died. Madden was taken into custody and is currently being held without bond at the Rutherford County jail. Police have yet to say what may have started the altercation between the roommates.